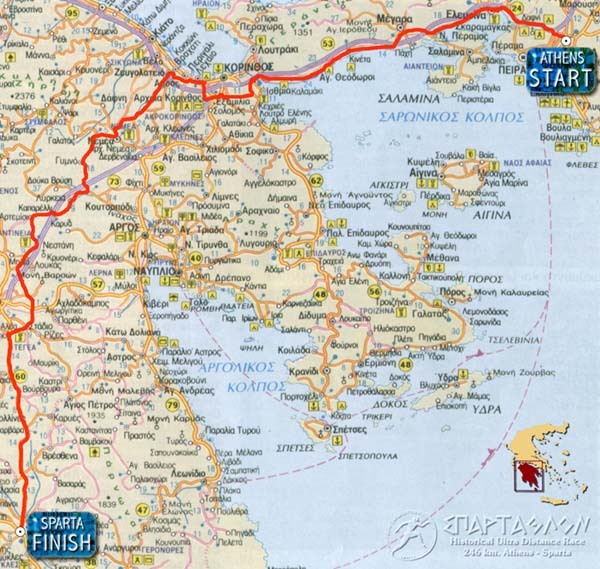 For those who don't know or remember well, SPARTATHLON is a historic ultra-distance foot race that takes place every year in September in Greece. It is one of the most tough and iconic ultra-distance races in the world because of its course and unique history. The Spartathlon revives the footsteps of Pheidippides, an ancient Athenian long distance soldier-messenger, who in 490 BC, before the battle of Marathon, was sent to Sparta to seek help in the war between the Greeks and the Persians. According to the ancient Greek historian Herodotus, Pheidippides arrived in Sparta the day after his departure from Athens. Inspired by the report of the Greek historian, in 1982 five officers of the British Royal Air Force (RAF), who were also long-distance runners, traveled to Greece, led by Colonel John Foden. Their purpose was to test whether it was possible to cover the 250 kilometers separating the two towns in one and a half days. The enthusiastic British team showed that the report by Herodotus was entirely plausible, with finishing times under 40 hours. 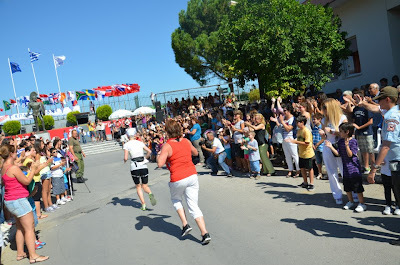 After the success of the project, John Foden began to envision the establishment of a race that would bring long distance runners to Greece from around the world to run on the trail of the ancient runner Pheidippides. In 1983 a multinational team of British, Greek and other supporters of the idea organized the First Open International Spartathlon Race, wherein the name for the race combines the Greek words for Sparta and Feat. d) of no importance for the race records but all the more for my records: this was the first race I really wanted but DID NOT FINISH (DNF), simply because of the heat. Or maybe not that simple, as I will explain further! Although I did not run much farther than to the end of the first leg in Istmia, just across the impressive canal of Corinth, it's enough to share some impressions and learn some valuable lessons. Despite a scrambled tapering period due to an unexpected travel to Belgium and back right before the start of the race, I dressed up Friday morning at 5am, with enough confidence to make it to the finish. The start at the Acropolis at 7am, surrounded by peers and supporters added some more adrenaline but I kept my coolness not to head out too fast. Only 20km in the race I started to pick up slower runners and really feeling 'fresh' way beyond the first marathon mark of 42,2km. Despite the agonizing course with heavy traffic rushing towards the capital city, there were pleasant moments of chatting with ultra-running friends from all over the world, of whom many from the Olympia Ultra Trail race (180,1km), where I finished 4th in May this year (see Spring Running report). A critical point was the second uphill, where I 'cracked' during a training run in Mid-August, but this time I could simply keep running while many others were already forced to a brisk walk. Even the point where I've quit my training attempt to reach Corinth, at the 57km mark, I passed with an indestructible feeling. However, by that time the sun was really burning and my core-body temperature was definitely on the rise. 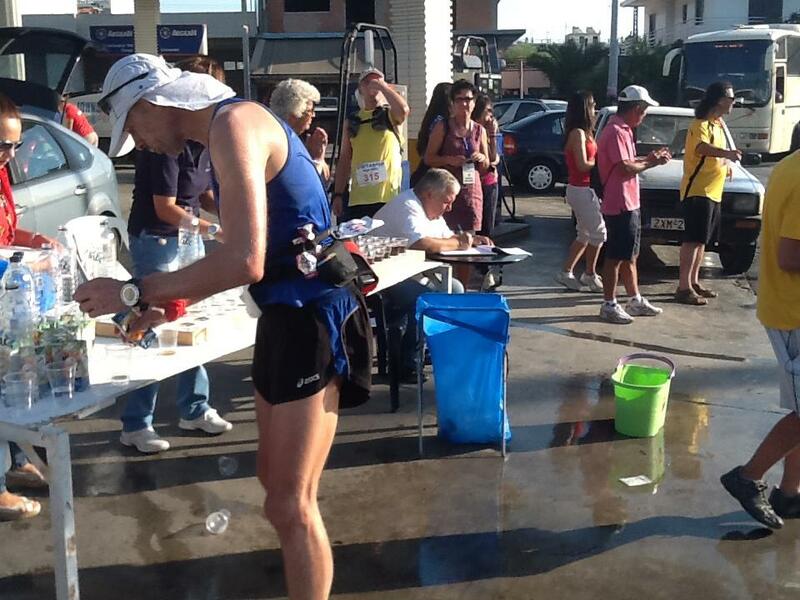 Water and sponges were available, as well drinks but all heated up by the sun, so missing the point actually. Around 60km I BOUGHT a real refreshing soft drink and a bit later another one. However, it felt like trowing cold water on a steaming radiator of an overheated car, thus only producing more steam. My pace gradually decreased and soon I found myself walking hilly as well flat stretches. The sun seemed to shine even harder and I couldn't resist resting a couple of times in the shade of a tree or in a bus shelter. It felt like the sun had poisoned my legs, lungs and heart and the exhaust of cars and refining industries along the course did not help to fight and resist this process. I saw my comfortable margin vis-a-vis the feared cut-off times melting away and volunteers at check-points urged me to keep on going not to miss the strict deadline at CP 22, at 80km distance in the race. The combination of the cut-off stress with soaring heat, burning legs and lunges, aggressive traffic and dull scenery sapped away the last joy of running and negative thoughts were gradually damping out the pool of confidence, up to a point I had to persuade myself to AT LEAST run-walk to CP22. IF I could make it within the cut-off time of 9,5 hours, and IF I might pick-up a second wind just before entering the aid-station, MAYBE I could make it to the next check-point and than see again. So I had to dig deep to keep going and although I was hardly running anymore, there weren't that many runners overtaking anymore, which meant they either had given up already or they would face great difficulty to reach CP22 on time. I hoped for a second wind when I finally crossed the canal of Corinth, a well-known point in the Spartathlon, as well a geographical landmark entering the Peloponnese, the 'homeland' of Sparta. But the wind was of short breath when I entered the devastating motorway leading to CP22. When I finally arrived at CP22, at 16h20, I thought I only had 10' left before closing time, too short for a decent recovery as I've had planned before the race. When I realized I couldn't even push down some food and liquids anymore, I know I was doomed - despite the extra time of 30' before closing. Nevertheless my Belgian friends Jan and Marc initially succeeded to get me going again and head out to the next CP. But hardly one 1km further I felt like a roasted chicken running around without head, and without much thinking (obviously), I could not overrule my feet turning around and RUNNING BACK to CP22, to simply hand over my bib numbers and my chip, which means a definitive end to the race. However I must admit that my brain simply calculated that CP23 or any further simply adds complexity in finding a way out of this race. A more serious calculation was that the heat at 4.30pm was far from declining and that IF I would make it through the next 3 hours of solar torture, I will have to face it another 10 to 12 hours the next day, which was an unbearable thought. One hour after my decision to surrender, I was lucky to be driven back home by my friend Dimitris, who was actually on his way to support me through the second and third leg of the race. When Dimitris asked me I would retry next year, I simply answered NO WAY. I told him I simply didn't like this race, that the course is far from enjoyable and that the organization of aid-stations and traffic control was far from the standards I am used to in international races. These critical reflections were later mirrored by the first hand assessment of my friend Leonidas, who followed Lizzy Hawker from start to finish (see his blog report on http://polyenios.blogspot.gr). Leonidas concluded that the organization of the race should try to improve several aspects so that this race becomes an "ambassador" of Greece to ultrarunning community, more in particular (among others)that the organization should try to control or minimize road traffic (one way traffic, cones, more traffic police), that check points should be accessible only to those involved in the race, and last (but least likely) that the organizers should also consider modifying the course to include some forest/agricultural roads if this would keep the runners out of motorways. Leonidas also touched one other cardinal aspect: that of mind over body. "This race is the most profound proof that these distances are conquered only with the brain and the heart, and not by physical training only. The real challenge of Spartathlon is not the distance or the strict cut off times. It is the mental and emotional difficulties that each runner has to overcome in order to arrive at Sparta." Leonidas is right on that, but my experience is that its all about the BALANCE and the INTERACTION between legs, heart and brain. If legs are severely cramping due to critical loss of electrolytes, a strong heart or mental focus will probably not compensate. In my case it was not about cramping but probably a gradual increase in body temperature due to a natural high sweat rate and lack of cooling options at the aid stations. Sweat rate and heat management can be improved by specificity training, but is to a large extent genetically determined. It is my guess that the 72 finishers were not only extremely well prepared but also owe a lot to their ancestors' DNA. Some try to help nature a hand by investing time and money to find specialized gear for running in the heat. I saw some naked torso's - I don't believe this can be helpful - but most runners were 'normally' dressed up while a minority ran with covered limbs, mostly white but some entirely black. Yet, among the finishers they were not disproportional represented so I don't think that this is THE answer or strategy. As with shoes and other auxiliary gear it is probably a very personal and individual issue and quest for what works best for you, mainly by trial and error. Even the placebo-effect can be worth trying different things. Coming back to the mind over body issue, I was struck by the race feedback from Leonie Van den Haak, a Dutch female runner finishing 8th overall in her debut. I know Leonie as a FB-friend since some months now and I followed her preparation for the race. 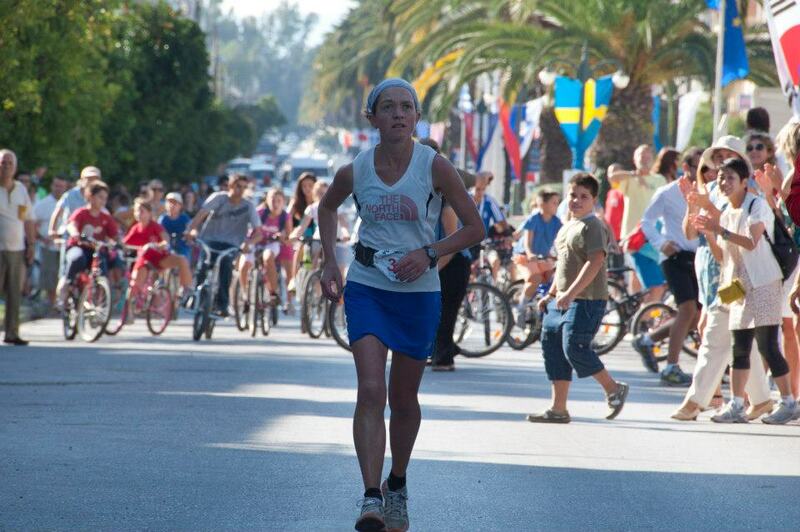 She's not only gifted as a natural born ultra runner; she's not only training hard and racing often as most of the Spartathlon starters - what made this tiny white runner excelling is probably her mental focus, determination and almost naive enthusiasm. Since her qualification and registration, the Spartathlon was the only thing that mattered and she created a lot of positive pressure around her, including from a mainstream sporting sponsor. Yet, as soon the starting gun went of, she was determined to enjoy every moment of what she wanted to achieve all that time. And she did. The moment she passed me around 60km, the time I was entering the dangerous path of negative thinking, she was still one big smile. The sun was also burning on her skin, yet it didn't seem to bother her - more likely: she didn't want to be distracted by this 'detail'. And because she was able to maintain the positive momentum, she could gradually climb up in the ranking to finish 2nd female after the much more experienced Lizzy Hawker. As a matter of fact, I believe that all 72 finishers could only make it because they did not allow their mind to take stock of the suffering body and simply block out negative thinking. For some of the finishers - some of them I know personally - it was almost a matter of life or death, which is a simple choice for a healthy well trained athlete. 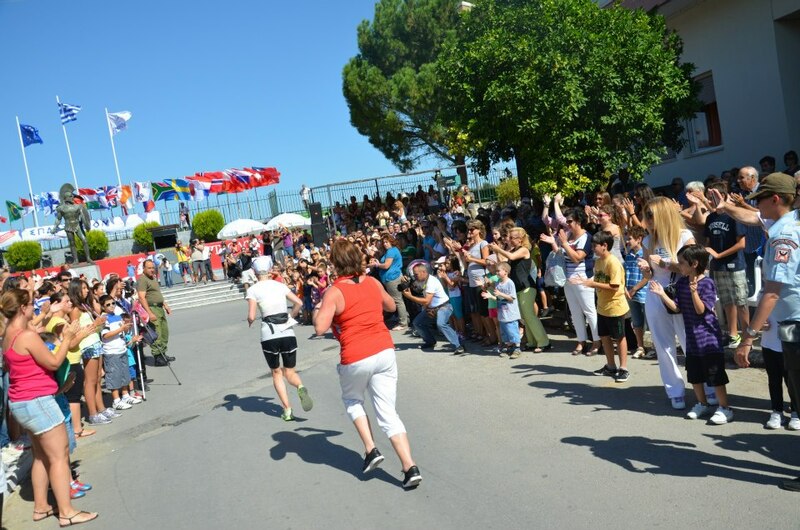 For some, the Spartathlon is nothing less than a kind of pilgrimage or a journey or search of moral or spiritual significance. Typically, it is a journey to a shrine or other location of importance to a person's beliefs and faith, although sometimes it can be a metaphorical journey in to someone's own beliefs - the place of their "calling" or spiritual awakening. In mainland Greece, a stream of individuals made their way to Delphi or the oracle of Zeus at Dodona, and once every four years, at the period of the Olympic games, the temple of Zeus at Olympia formed the goal of swarms of pilgrims from every part of the Hellenic world. When Alexander the Great reached Egypt, he put his whole vast enterprise on hold, while he made his way with a small band deep into the Libyan desert, to consult the oracle of Ammun. It is my impression that for some the statue of King Leonidas in Sparta, a historical figure but with no direct relation to Pheidippides or the origins of the Spartathlon, represents a post-modern shrine or oracle. The fact that some also run with a large tattoo of the Spartathlon logo on their calf is probably also a sign of a soul-searching (and finding). That probably also explains why many 'Spartathletes' refuse to criticize the race, although there are plenty of reasons if you consider it objectively. So, IF I would retry to run from Athens to Sparta on this given course, the single most important strategy will be to immerse myself in the 'beauty' of this 'beast', with the indestructible will of Alexander the Great to consult the oracle of Ammun as a matter of life or death, of victory over defeat. And although I've declared already NOT to come back, the award ceremony and some incremental introspective thinking are pushing the needle back to a MAYBE. IF I'm able to get the mental focus sharper than ever before on REACHING SPARTA, then "maybe" will probably become ...PROBABLY. For the time being I will now focus on the remaining task for this running season, to complete the last leg of Pheidippides epic runs, from Marathononas to Athens, in other words the Athens Classic Marathon, on Sunday 11 November. Finishing should not be a real issue, since it will be the sixth consecutive time I'll run this race. Finishing as fast as possible after a transition year from marathon to ultra-marathon running; that will remain a challenge. 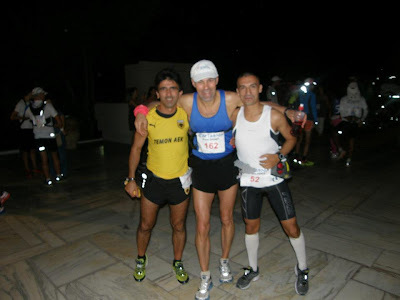 PS: my sincere congratulations to all finishers of Spartathlon 2012, including two of the seven participating Belgian compatriots, Stefaan D'Espallier(39th)and Rony Jansen(60th). The Spartathlon Challenge is about the mental / emotional reserves and the focus / determination of every participant to get to the finish line. You must train your body to support your mind. But it is only the mind that will keep the runner going when everything around is shouting in your face to STOP! From all ultra endurance races I have experienced so far, this is the only one that is a real fight in the mind of the runner. It is not oonly about overcoming the "ups and downs". It is about genuine deep desire and faith! The finishers believed that they could walk on water... and they did! It is a soul cleansing experience. Still... some details should be better organized! Ultra running is always the fight between facts & figures (preperation, pace, heat, cold etc) and inner dreaming!!! Having a very bad moment (quit a race) it will generate the passion for harder training for the next edition of the race. Of course you'll try again next year and I´m absolutely sure that you will then reach the statue of Leonidas.